The person who first referred to a difficult task as a “tough nut to crack” must have struggled with smashing open a black walnut. Last week I collected up some of the stubborn nuts from underneath the park’s one and only black walnut tree. I knew from childhood experiences with my grandmother’s black walnuts that nothing less than a heavy hammer would be necessary to reach the meat inside the tough shell. I gave up after some halfhearted efforts to extract the meager morsels which take the skill and patience of a surgeon to extract. Why does Lake Claiborne State Park have only one black walnut tree, a species native to north Louisiana? Since the walnut’s distinctive flavor and texture are not lost in cooking, it has long been used in cakes, candies, and ice cream. Early colonial settlers in America discovered the wood to be hard, yet soft enough to work easily. It is coarse grained, finishes well, absorbs shock, only shrinks slightly when dried, and resists decay. The outer sapwood of the trunk is white and not highly valued, but the inner heartwood is a rich dark chocolate brown of unsurpassed quality, making it the most sought after native American wood, especially for furniture. It is the wood of choice for gun stocks. Seldom is modern furniture made completely of black walnut, however. Today, because of its rarity and expense, black walnut is cut into thin (1/32 or 1/64 inch) sheets–veneers to be glued over inferior wood for most walnut furniture. Black walnut paneling is available but is quite expensive. Until it was replaced by synthetics, walnut was used for airplane propellers. Our one tree is located on one of several old homesites within the park. Not far from the park entrance station, the big tree would have been just a few feet from the back of the house. It was apparently planted by the homesteader for its nuts which mature at a time when other foodstuffs are unavailable. If there were native trees in the area, they have all been cut. While not in danger of extinction, black walnut trees are uncommon in the natural landscape. Because of the great demand for walnut wood for over a century, they are rare outside established plantings. Their growing time is so long (a minimum of 60 years to get a reasonably large trunk) that repopulation can’t keep up with demand. Buyers search out smaller and smaller trees as their value rises. A well grown, straight trunked, 200-year old tree can sell for tens of thousands of dollars. The walnut fruit is protected by a green leathery husk that turns black after falling from the tree. Husks and nuts allowed to sit in a bucket of water for several hours will produce a dark brown/black liquid, which if poured over soil, will in minutes drive every earthworm in the area up to the surface for easy picking. Boiling the liquid produces a dye that stains everything, including fingers. Native Americans and early pioneers used it to dye homespun cloth, giving it a dark brown color. Trappers boil their traps in the dye to provide a modicum of rust protection. The tannic acid in the walnut hulls combines with the surface layer of the steel, creating a chemical bond between the dye and metal. As this bond is established, the steel will change from its steel gray color to dark black. The blackened traps are much more resistant to rust than bare steel. Our single walnut tree most likely helped a farming family survive as they literally lived off the fruit of the land. The sight of seven wild turkeys just outside the park this week brought to mind the changes to our regional ecology during my life. Forty years ago when I was tramping through nearby woods on youthful expeditions, I never saw the big bird Benjamin Franklin wanted to designate as our national symbol. Prior to 1880, as many as one million wild turkeys populated Louisiana. However, by the turn of the century, the state’s turkey population began to tumble. Timber production and unrestricted hunting played roles in the declining wild turkey population in the state. By 1946, an estimated 1,463 turkeys populated Louisiana. With the initiation of a restoration program in 1962, Louisiana’s wild turkey population has grown slowly to an estimated 80,000 birds. Sightings are no longer rare in the areas around Lake Claiborne Park. The bobwhite quail’s lonely call once delighted area farmers who rested on their porches after a hard day in the fields. I first heard the high-pitched “bob-white” whistle sitting with my grandmother on a summer evening 45 years ago. The bobwhite has all but disappeared from north Louisiana despite efforts by the Wildlife and Fisheries Commission to reestablish the small bird. A number of factors may attribute to its decline—an increase in the population of predators, the infiltration of fire ants into the area, and changes in habitat, such as the replacement of natural forest with pine plantations. When my father grew up down the road in the 1930s and 40s, he never saw a deer. Much of North Louisiana was sparsely forested compared to today; the red clay hills were planted with cotton and food crops. 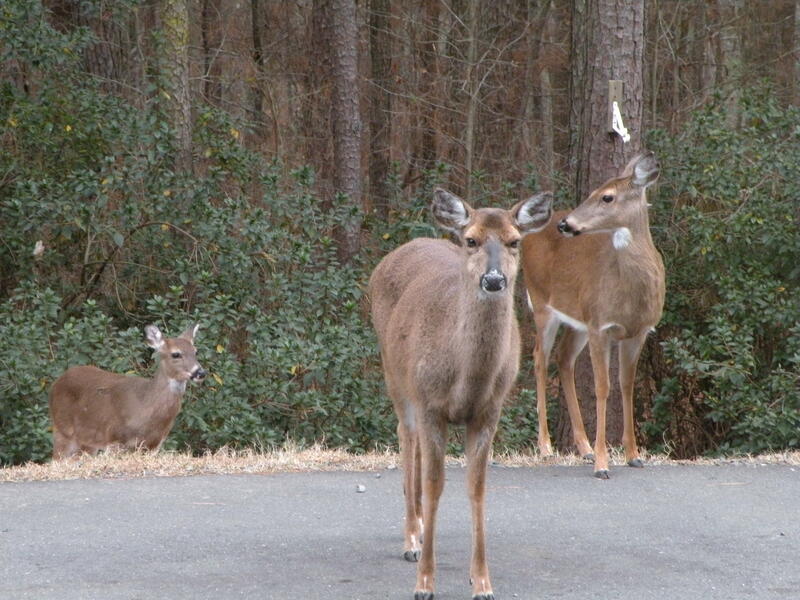 The habitat to maintain a deer population did not exist. Hard to believe today with our woods on the verge of overpopulation with deer. While our park is teeming with squirrels, they aren’t the same ones I hunted—usually with little success—as a teenager. Our little gray squirrels have all but replaced the larger, reddish fox squirrels that dominated the area in decades past. The fox squirrel is still around but in much smaller numbers. However, gray squirrels are everywhere! The casual observer would be unlikely to detect the subtle modifications occurring over decades within local wildlife populations. Whether you believe these shifts are due to man’s manipulation of the environment or the forces of nature, the changes are occurring. 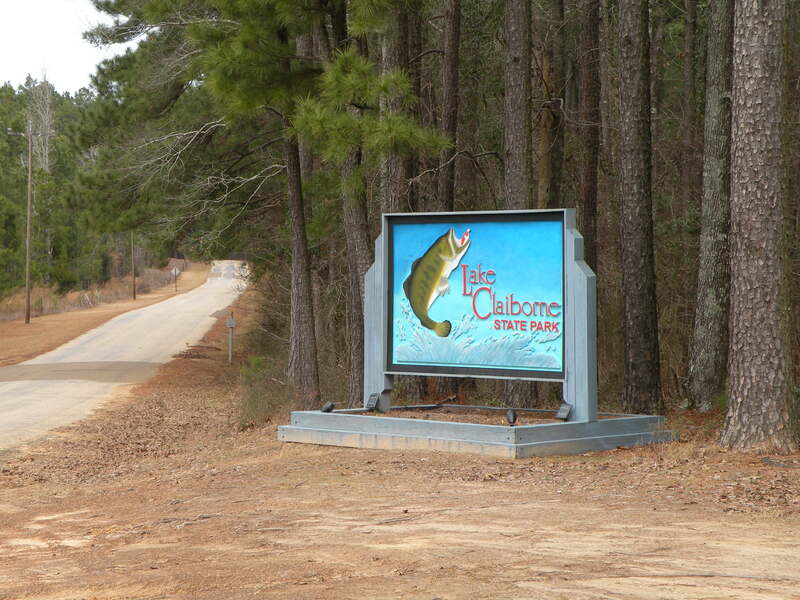 Either way, wildlife abounds in Lake Claiborne State Park and the surrounding area. 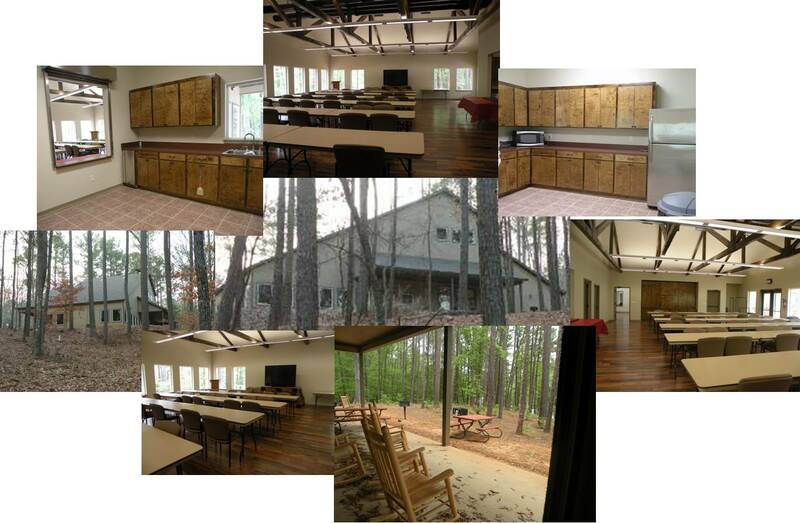 Lake Claiborne State Park boasts a new Nature Center. It is now available for reservations. It has a capacity of 70 occupants. The rental rate for the Nature Center is $100 per day. Check in is 7:00 am and check out is 8:00 pm. This is a Day Use Only facility. It is not available for overnight use. Included in the Nature Center is a Warming Kitchen. This has a full-sized refrigerator, microwave, and sink. Also in the Kitchen, you are provided with a small ice maker. In the large seating area, there are 20 tables accompanied by 54 chairs. Also included is a podium for guest speakers. Currently there is a TV in the Nature Center for your use. You can hook up any DVD/VCR or Game Consoles that you would like to bring. Unfortunately, at this time, we do not have satellite or WiFi at the Nature Center. The patio is equipped with 8 rocking chairs and 3 picnic tables for your comfort. Two park style grills are also stationed outside the Nature Center for your use. We hope to see you at our park. If you are interested in viewing the Nature Center before making reservations, feel free to come out to the park and we will have someone give you a tour. It is ideal for family reunions, business meetings, weddings, etc. Keep us in mind for your next gathering. While out enjoying a nature hike, be sure to keep your eyes open. Wildlife is everywhere but it may take a keen eye to spot a wary racoon, deer, or opossum. This waterfall pictured is accessible by trail. It’s not always flowing but when it is, it is a sight to be seen and heard. Ask for a trail map and experience nature. You might even get to see our bald eagle. So, take it easy, enjoy yourself and there’s no telling what you might get to see. I’m sure that you will enjoy your hike at Lake Claiborne State Park. I hope that you gather lots of stories to share with friends and family. Feel free to share them with us, too. We always love to hear about your experiences at the park. This is copied from a short story that has been passed around the park. 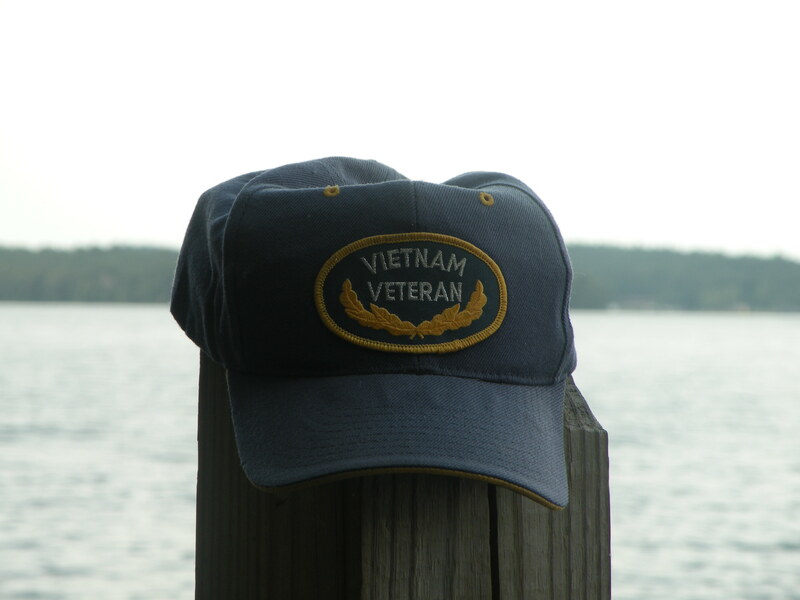 It is a true story about Lake Claiborne. I hope you all enjoy it. Lake Claiborne State Park officially opened its gates to the public in May 1974. But, the park did not happen overnight nor without dedicated, exhausting work, and reams of paper. The Emersons and other prominent members of the Claiborne communities spearheaded the effort and after many years of work on that day in 1974, their dream became a reality. The mission was to find a way to increase economic rebirth into the Claiborne Parish area and to provide some form of recreation for the parish residents. Since its inception, Lake Claiborne State Park has continued to mature. Long range plans since the 1970’s have added many welcome features within the boundaries of the park. 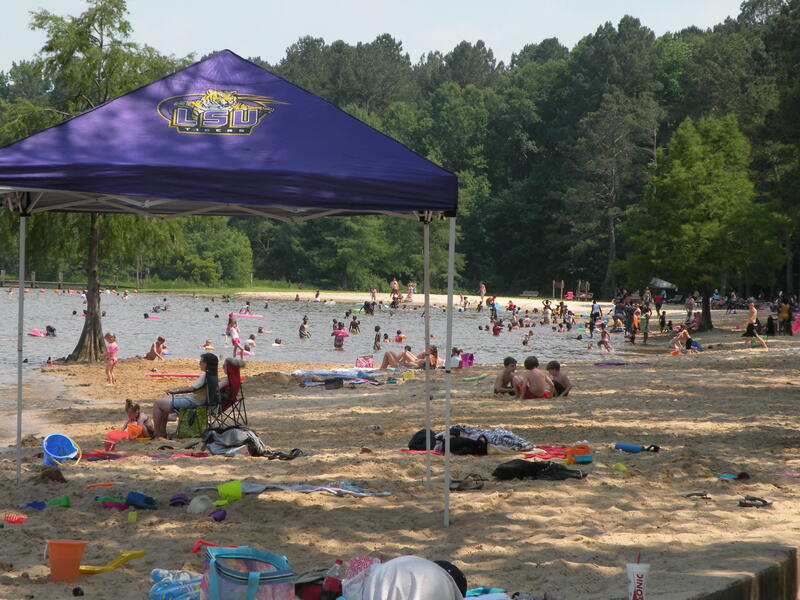 Those early goals and careful management over the years have made our state park one of the premier nature and recreation spots in the north central Louisiana area. Interest and popularity have increased by leaps and bounds with successful advertising and the addition of cabins. Tourists from across the United States and foreign countries have regularly visited the park and been delightfully appreciative of the many natural features and facilities. Centuries ago, this land was wild and free. There were streams and wildlife of all kinds to be found in abundance. Native Americans who lived here or traveled through the area found a vast resource of flora and fauna to sustain their lives. As in many other parts of the country, nearly all of these tribes were nomadic or semi-nomadic. By the time Europeans arrived, many ages of Indian culture had risen and fallen. Their artifacts can still be found in many fields and along the older streambeds. With the arrival of the early European much of the Indian culture became lost and a new way of life slowly emerged. Spanish, English, French and the emerging United States vied for land, wealth, and power as those early frontiersmen pushed westward past the Mississippi River. Where once the forests and plains of North Louisiana range with the sounds of wildlife and native tribes, other harsher sounds began to take over. Trees were cleared to make way for pastures and cabins. Land was opened to thousands of people from many cultures and walks of life. These people were eager to claim a place of their own and slip the bonds of their past. For the most part, these early settlers were tough, self-sufficient woodsmen who fought and often died to establish their homes. Many of the early pioneers traveled through or into North Louisiana in their quest for land. There are a few speculations about the very earliest travelers through the Claiborne area though not much has been found in the way of hard evidence to support the claims. Obviously, the early French fur trappers along with colonial backwoodsmen, and British or Spanish expeditionary forces did explore the area but it wasn’t until the first of the homesteading pioneers arrived that changes began to visibly noticed. In the early to middle 1800’s, people back East in the colonial states began to read about and listen to tales of the land and animals to be found in the North Louisiana area. Some of the accounts were wildly exaggerated to help catch the eye and spark the interest of the people back East. The Spanish, French and English had already sent out expeditionary forces and in some cases established trading posts and roads throughout this area. Then came the Louisiana Purchase and with it a surge in settlers. The first act of the Louisiana General Assembly that met in 1807 was the subdivision of land in the state of Louisiana into seventeen divisions known as parishes. The parish of Natchitoches actually encompassed all of Northwest Louisiana from Natchitoches northward. With the influx of colonists, this became an unwieldy way to govern. In 1828, Claiborne Parish was carved out of the Natchitoches Parish. This newly formed division included most of north-central and northwest Louisiana. It was named for W.C Claiborne who was the first territorial governor of Louisiana. In 1856, Claiborne Parish was the largest upland parish in the state. By 1865, however, Claiborne Parish had also become large in population. It also was sub-divided into smaller parishes. From being the largest upland parish, the boundaries shrunk to become the smallest northern parish. The same year Claiborne officially became a parish, John Murrell settled in the northern portion near Homer, Louisiana. He was an active businessman and interested in the political growth of his area. In fact, his home was the first place the newly formed parochial government and parish business was conducted. His house stood beside what is now called the Old Military Road. Years before the Legislature had authorized the military to build a north-south highway. This became the logical place for people such as the Murrell family to settle. From 1828 until 1849, the parish seat moved to four different locations that for one reason or another were abandoned as the parochial government. Then in 1849, the governing seat was finally moved to its permanent home in Homer, Louisiana. There was much speculation about the fortuitous move to Homer since the town of Homer did not incorporate until 1850. During the winter of 1849 and early months of 1850, the original courthouse was built and the judge, sheriff, and clerk opened the court. The oldest record of the Police Jury is dated November 6, 1849 because fire had destroyed the earliest records. By 1858 two more courthouse buildings had been erected and abandoned. Finally, in 1860 the last courthouse was built. The Ford Museum in Homer has quite a detailed history of the growth and changes to this part of Claiborne Parish. On the grounds of the State Park once stood homes of some of the people who moved to settle in the area. Many their names can still be found in today’s local population. Like early settlers everywhere these families came to lay down roots, to carve homes out of the forest, and to begin dynasties. Those who stayed here were survivors. They were tough, independent individualists who ran self-sufficient and self-sustaining farms. They farmed large acres of land, some of the products eventually found their way to market after all that was needed for the farm had been put up for use. Crops like cotton, sugar cane, sweet potatoes, peanuts and a variety of vegetables made up their saleable crops. There were orchards with various fruit including apples, peaches, figs, plums, and pomegranate. From the forests came a variety of furs, fish, meat, nuts and berries for their larder. Many of the women knowledgeable in healing could be found gathering leaves, roots, berries, and flowers for their many medicinal needs. Few of the early settlers had money to spend. What little they could acquire was spent only on necessities. Farm utensils and equipment, seeds, basic food ingredients such as flour and sugar as well as cloth goods for clothes were about the most that these people had to acquire. If the money was not available, then the farmers made do with what they could make or grow. While the men planted, harvested, and hunted, the women were also busy. It fell to them to clean, cook, preserve, garden, doctor, and sew everything that the family used. Needless to say, no one living on a farm was ever idle. Eventually, conditions did improve to the point that the people had more time to concentrate on other matters. The men built the mills, prepared syrup, ran the stores, and became involved in politics. Occasionally, some of them made whiskey to sell though women rarely acknowledged that their menfolk would take part in such a sinful enterprise. The women were also able to take part behind the scenes to bring a more civilized society to the area. They as much as the men were responsible for seeing that higher education, arts and music, and law and order prevailed. By the time the Civil War came, there were many landowners that had begun to prosper. As a result stores and other forms of industry moved into the area. Commerce was brisk, education and the arts were prominent features in the area. The economy was booming. With the advent of the Civil War, things changed drastically. Fewer of the early settlers were able to hold on their huge family holdings. Sharecropping and smaller farms became a necessity. The land and people of the park area survived over the years but at great cost. In the early 1900’s, Homer and Claiborne Parish experienced a resurgence in economy with the discovery of vast fields of oil. The lumber industry also became an important money source. As a result many of the younger people began to emerge into an industrial era where farming was less likely to produce monetary gain over industry. Several families including the Butlers, Carters, and Simons purchased land in the park between 1885 and 1900. These families worked hard to live in an area where the wealthy were very wealthy and the poor were very poor. The area had just begun after the horrors of the last century to recover from corruption and mismanagement. They like those before them farmed and were self-sufficient. And, like the earlier settlers, produced many of the same crops and relied upon their own farms to provide for their needs. If you enter the park and drive to the flagpole, you are looking at what once was the home of Mr. and Mrs. Jethro Butler. Mrs. Butler was the daughter of the Carter family. A short distance into the woods is the old water well for their house. It was about 100-foot deep. The local folk believed the water had natural gas in it. The descendents of this couple remember having fish-fry dinners and parties nearly every weekend. It seems the menfolk would wander down to D’Arbonne Creek a ways from the Butler home. They would either lime the water or use an old Indian trick of crushed black walnut husks to catch fish for dinner. This may not have been the only reason that the menfolk ambled down that way each week. One lady recalled how upset they got when she went down to the place where the wood ash was kept. Wonder what was in that area? One family member stated that they did not know what money was back then but they sure ate better than most people did in the country. From the forest came deer, squirrel, waterfowl, turkey, fish and other kinds of meat to set on the dinner table. At home, the tables and storage sheds groaned with the weight of the many kinds of canned goods and smoked meats that had come from their gardens and their livestock. To the east side of the well can still be seen evidence of terracing where orchards and gardens flourished. The Butler descendants of today can still recall visiting their Gran’s house. Further down the road to day use where the day use exit meets the main road is a small clearing. Hidden inside the clearing is little that remains of the J.W.E. Carter home. The bushes you see include crepe myrtle and chinaberry trees. These stood in front of the old house. Further back now is a small cleared area, which was the Carter home site. An old fence marked the location of the house until recently. The Carters settled on the land in between 1880 and 1901. They built what is usually known as a “dog trot” house. They personally called it an open-hall style. Dog trot houses got their name from the open “hallway” between the living areas on each side. This is where literally the dogs could trot through to the other side. The kitchen of the Carter home stood alone behind the main house structure. This was a common practice back then to keep any kitchen fires (which occurred quite frequently) from spreading to the living quarters. It also helped to keep the heat of the kitchen area from the main part of the house. The old home had a fireplace on each end made from iron ore, mud, and straw. They actually farmed down the hill from their home in the bottoms of what is now the lakebed. The ridges were actually too rocky and full of iron ore for them to use. Sweet, clear water came from the Butler well. However, their well met with an accident of nature. Lightening struck a huge old tree near the well. Somehow this event introduced alum into their well water. Alum made the water bitter. Like eating a green persimmon or sucking on a lemon, alum “puckers” the mouth. Back in those days, alum was used as a home remedy for reducing wrinkles, keeping strong teeth, and bringing out impurities. It can still be found on some store shelves for its medicinal value. Somehow, one wonders just how much of that alum well water was drunk by the owners or if some of it was set aside as medicine. At the time the Carters lived on the homestead, the land around the house was very steep. Every time their wagon descended the hill to the fields or the river, the wagon wheels had to be chained in place to keep the wagon from rolling over the mule. When the park road was built, some of the steepest part of the hill was leveled to reduce the grade. Near the boat ramp is a small foot-bridge that connects the oldest camping area to the day use area. The bridge crosses over what appears to be a tiny stream that tumbles into the cove. Before the lake was formed, this small area was quite different. With a little imagination and the quiet sighs of the wind, one can almost hear the laughter and splashes of the children. This was their favorite water hole to swim in each day. The creek was larger and tumbled into a “wallered” out hole where cows had come for many years to drink their water. The hole was deep and all around it was pretty white sand. The last homesite to be discussed can be found beside the park road between Area 1 and the cabin road. Going toward Area 2 just before the cabin road, if you look to the left there are huge old white oak trees. These trees stood in front of the Simon’s house. The Simon family who was related to the Carters and Butlers originally owned the house. Scattered around the area are old home site plants long since grown wild. Like the Carters and Butlers, there was much that this family did as they lived in the area. At one time a small tin shed was all that remained to mark the place where they lived. It was used over the years to store potatoes. Most recently , it became home to a family of buzzards who raised their brood within its sheltering walls. Interesting stories always get passed down through generations of folks. One story passed down concerned the Butler house. Parents and grandparents told the children that an Indian was buried in a small mound close to the house. The children’s’ imaginations kept them well away from the “burial site.” As one of the sisters said, “especially at night.” Easter egg hunts were held each year but even those were kept away from the small mound. While much is still not known about the local native Americans, arrowheads and a few other artifacts have turned up over the years in the plowed fields. Also, according to one person, when the lake water is very low, a few supposed artifacts can be found in one area. So perhaps the story of the Indian holds more than a grain of truth. There are two very entertaining stories, which traveled down. The first is about the Simon house. It seems that the Simons’ woke one morning to discover a pig was missing. Since it had finally reached eating size, the Simons were understandably worried. They believed the pig had been stolen. Several days later and after much ado, the pig was found. It had accidentally fallen into the well but was still alive and healthy. It survived by living on a narrow ledge near the waterline in the well. Overhead, oak trees were dropping their acorns and some found their way into the well. The pig had plenty to eat and water to drink. Most agreed the pig seemed content in its surroundings but the menfolk were not about to let it stay in its new home. They climbed down and after much effort rousted the pig from the well. The children reckoned that the pig had actually grown some while it was living close to the earth so to speak. It wasn’t long after that the well-dwelling pig became food for the larder. At the same time, the Simon family had another unusual barnyard animal. It seems that they owned several goats. One goat is of particular note because he had learned to herd cattle. Apparently, every morning after the cows were milked, the goat would herd them down into the pasture for the day. Each evening the goat would then go down to the group and herd them back to the barn! One interesting piece of information that came to light about the park area is that over the years, the army did annual maneuvers and training on the land that is part of the lake and the park. While on one of their training missions, they discovered a cave. For many years army personnel kept supplies hidden in between maneuvers. One man who lived on park property was told of the cave’s location and asked occasionally to retrieve the stockpiled supplies. In the mid-1960’s, some of the families sold their land willingly to the state government but the Butlers and Carters were forced to sell as part of the state purchase. It had to have been a painful loss to leave behind the land they had worked and the graves of their family members. The land then became the new lake and eventually the homesites became an important part of the State Park. The majorities of the descendants of those families still live and work around the northern Claiborne area. Most of those descendants approved of the land use. Lake Claiborne State Park is not just a recreational area but it also holds the history for many of the areas earlier generations. People from all walks of life, different homes with different stories, come through the gates of the park each year. The beauty, peace, and contentment they found within its borders affect them. Perhaps in some small way, they carry them in their hearts and memories—a piece of the history of the families who came before there was a lake or a park. The deer rule the roads. They don't like to move. Watch out. It’s that time of year again. Everyone is getting out the shorts and flip-flops. We still have some cool days thrown in but we can handle them. It’s time for camping, fishing, hiking, and all of those other outdoor activities that we all love. The park is in bloom and the animals are moving. That is a sure sign that things are great. If you drive through the park, you can see flowers and trees in bloom. Also, make sure you watch out for the deer, squirrels and other wildlife. With the cooler nights that we are still having, it makes perfect weather for a campfire and making S’mores and roasting hot dogs. 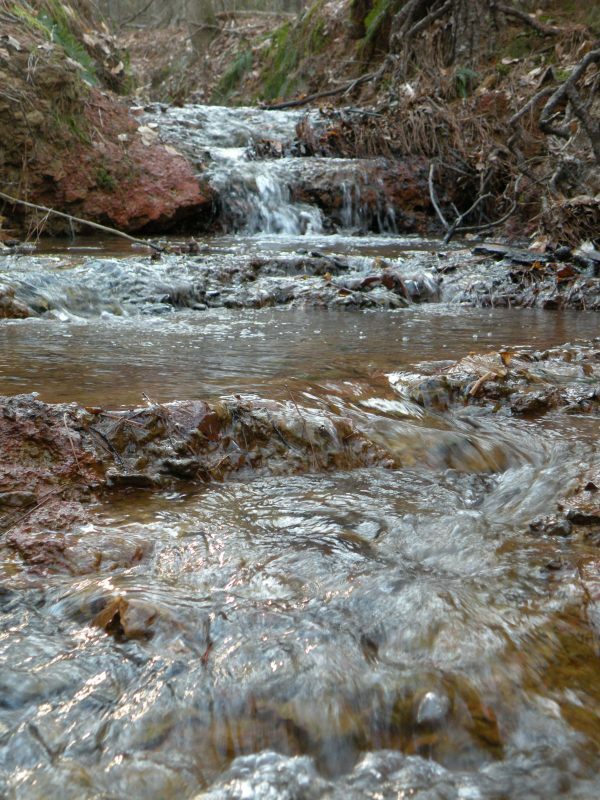 During the day, while it’s warm, enjoy the hiking trails and other activities that are available at the park. We look forward to seeing you. Bennie wouldn't allow a photo to be taken of him, but agreed to let me use his hat. Imagine yourself just arriving at your vacation destination after a long day’s drive. You stop at the front office and check in, get your paperwork and head down to your campsite for some much-needed rest and relaxation. As you turn onto the road to get to the campground, your engine dies and will not start….it won’t even turn over. You’re now stuck going up a hill and halfway into a long turn blocking all in going and outgoing traffic as well. No other campers or RV’s can make it past you and it’s one of the hottest days of the summer…. That’s where I met Bennie, Betty and their grandson Mathew. I knew we had to get them out of their position since I had campers arriving that would not be able to get past the big 34 foot roadblock of an RV they had. The first things I noticed about Bennie was his big smile and the ball cap he had on (photo above). Now I’ve dealt with lot’s of folks on vacation and mostly they are very happy-go-lucky. But when you begin to have problems on your vacation, actually you hadn’t even started it, people start getting upset pretty quick. Not Bennie though, not even after he couldn’t get a signal with his cell phone to call his brother-in-law for some help (I let them use mine). In fact his wife Betty was all smiles too so that made my job a lot easier in trying to get them some help and a tow truck. All told the ordeal lasted over 3 hours in 100+ degree heat and thankfully their RV had a generator so they had air conditioning inside. I noticed Bennie was sweating a lot and he clutched his chest a few times so I asked him if he was feeling ok. He told me that he had some heart problems and that it was from some wounds he had received in Vietnam. I asked him to go inside and asked his wife to get him some cold water to drink while I went up to go call them a tow truck. The whole time he kept apologizing for bothering all the other folks in the park and for putting me through so much trouble. Thankfully everyone understood and was patient with us until we got the RV pushed out of the way to open up traffic. The next day, he began to call around to local mechanics to see if someone could repair his engine. I don’t know how much money this whole “vacation” cost him, but it had to be a lot especially since the tow truck and mechanic had to drive over an hour to reach the park, but Bennie never stopped smiling. I have to say it impressed me very much how he and his family handled all the problems they had the night before. Most people would have been very upset on a normal day, much less their vacation. After the mechanic repaired his motor home, I decided to give them a visit to see how they were doing and make sure they didn’t need any more assistance. Now being a veteran myself, I first told Bennie thank you for his understanding and how amazed I was that he did not get upset even a little bit about what had happened. I asked him if some things he lived through in the past had any effect on his outlook on life and he told me that it did. We talked awhile about his family and his grandchildren, he showed me a few of the scars on his body and described to me the injuries that he sustained. Reluctantly he also told me that he served 3 tours in Vietnam as a member of the Green Beret’s. I asked him if he had been awarded a purple heart for his wounds, he said that he received 3 purple hearts. After we talked some more I asked him if he had received any other medals during the war. He seemed to be thinking about whether or not to answer me, but after a long pause he said yes. He said that during his service he had been awarded 3 bronze stars (2 for valor), 2 silver stars (for valor), and the Army Distinguished Service Cross (the only higher medal for individual valor in combat is the Congressional Medal of Honor). This quiet, unassuming man is a real American hero and is one of the most modest and humble men I’ve ever met in my life. We talked some more about the military in general after that, he told me about how they used to train Navy SEAL’s…..and it was always a competition. He talked the most though about his wife of 34 years and especially those grandchildren. There was a couple of times during our conversation that he tried to talk me out of writing this about him. He said he’s lived many years trying to put that all behind him and since he wouldn’t let me take a photograph of him…..I asked for his ball cap instead. I shook his hand and told him thank you for his service to our country and I hoped he would come back and stay with us again sometime. But since I’ve had time to think about everything he said, everything the man lived through…what happened the other day seems like nothing. In fact, I’m embarrassed when I think of what I complain about because it pale’s in comparison. I know now why he seems so happy, I know why he smiles all the time…..it’s because today is the best day of his life. God bless you and your family Bennie…..and keep smiling…..don’t ever stop smiling. She's finally brave enough to bring the babies out into the open. 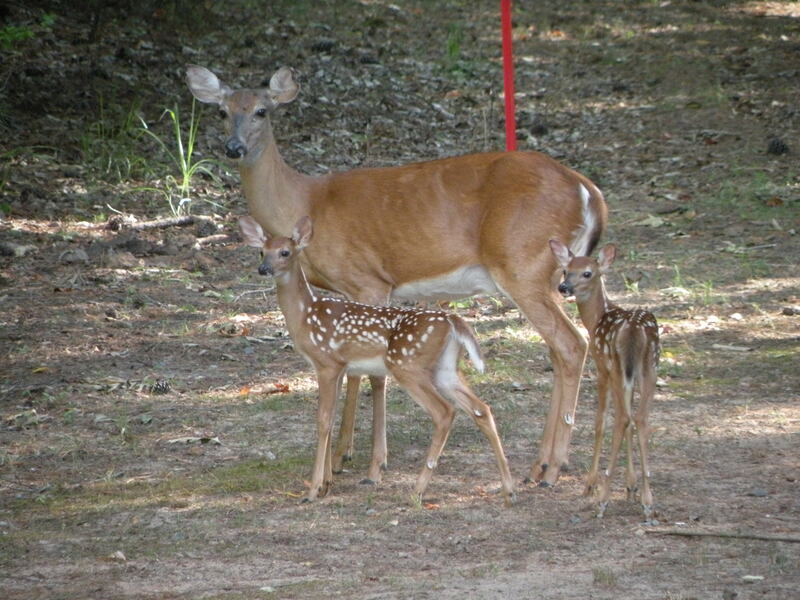 Once July arrives the young fawns are already 2 months old, perhaps 2 1/2 months at the most. The mother keeps them separated and hidden safely in the woods nearby. Since her young are born without any scent, the safest thing they can do is lie still in the woods. Any predator must practically trip over one of the young fawns to discover them. Once it gets into July though, she feel’s secure enough to bring them out into the open. At first you can tell they are still clumsy and will trip over themselves when startled. By mid July, they have become agile enough to keep up with the mother and will play with each other. They also have very demanding appetites, in fact they will stop the mother close to the road so that they can have some milk (I have not been able to get that shot yet) and you can watch them easily from your vehicle. The herd now stands at around 20 if you count the young ones, although we have only caught a glimpse here and there of the others. The photo above was taken near the front entrance and as you can see she is very used to people looking at her babies. Hope everyone had a safe and happy 4th of July! 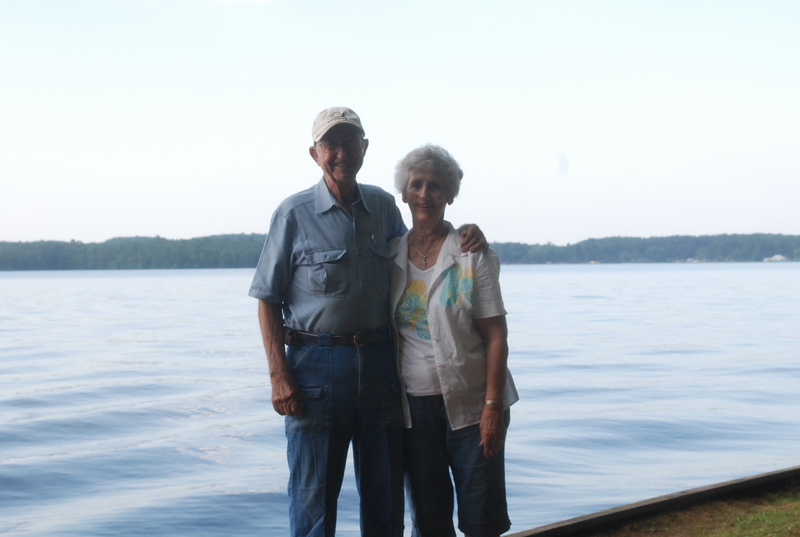 Tommie and RL Edwards celebrated their 61st wedding anniversary at Lake Claiborne State Park. After visiting with these two for over an hour, they told me many stories about their life together. Mr. Edwards told me about how he and his older brother, Troy, used to trap down in Little D’arbonne bayou long before it became Lake Claiborne. Back then, he said they didn’t do it for fun but to make a living. Mrs. Edwards told me about how they met and how she would ride the 1948 Harley Davidson motorcycle he owned on every date they went on. ” I really loved him, because we rode that motorcycle in the wintertime to go on our dates” she said. They were married on June 10th, 1949 and all Mr. Edwards owned was that motorcycle and a metal suitcase. “I bought that Harley brand new for $350.00 dollars, and in that day and age that kind of money was like a million bucks” he told me with a grin. They told me quite a few times that they had their fair share of problems, but Mrs. Edwards said that by keeping God first in their lives it helped them through the hard times. Mr. Edwards added some advice as well, “never let the sun set on a disagreement between you, work it out before you go to sleep”. During our conversation I asked them if they could give some advice to couples and they had a few things to say. “It doesn’t take money to be thoughtful” Mrs. Edwards told me. “I remember times when we didnt have fifty cents for a haircut, but you could buy a coke and go for a walk” she said. She also said that keeping things simple and being careful with money was important as well. As for the one peice of advice for men and women on staying together, Mr. Edwards’ advice was short and to the point, “if mama ain’t happy, nobody’s happy”. Mrs. Edwards said for men and women alike to “never lose your individuality” and that “you’re not just somebody’s husband or wife, father or mother, son or daughter….you’re you”. These two are the proud parents of 5 children, 9 grandchildren, and 6 great grandchildren. They also told me that the family is very close and the children call once a day to speak with their parents. I had a great visit with these two veteran campers and hope to see them here next year for their 62nd anniversary! This is a wonderful acheivement and on behalf of Lake Claiborne State Park staff, I would like to offer our congratulations to you! An early morning shot of the beach, it got a lot busier as the day wore on! I hope everyone had a great holiday weekend! Here at the park we were very busy all weekend long, doubling last years visitation for all 4 days. In total, over 3,200 people visited the park and that total does not include our 87 campsites and 10 deluxe vacation cabins. If you average in the people staying in the park overnight it would easily break the 4,000 person mark for the holiday weekend, perhaps even more than that. Everyone commented on how great the park looked and how courteous the staff was. I want to thank all our guests and especially the park staff who worked hard all weekend long so that everyone could enjoy their time at Lake Claiborne State Park. Here’s to a job well done!